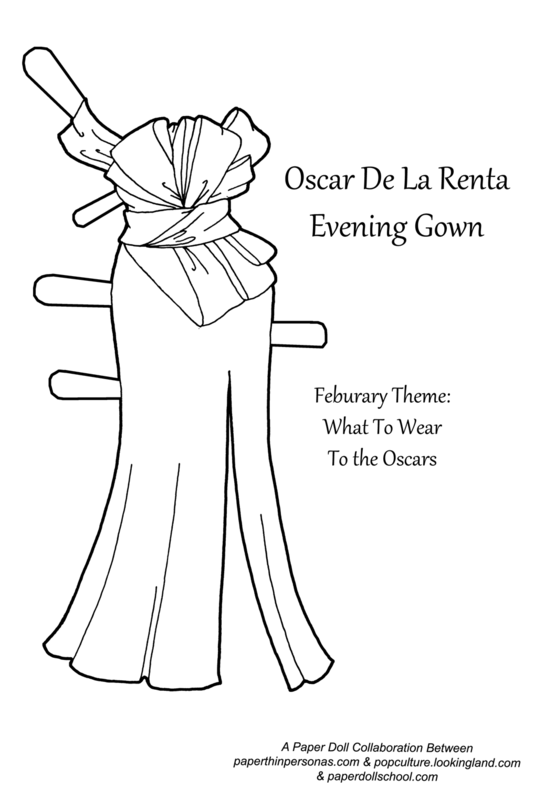 The February theme was inspired by the Oscars and we all decided to draw an Oscars dress. Well, I went with an Oscar De La Renta inspiration last month and I might have gone for the same thing again. What can I say? I love his designs. So, here is my 2017 Collab Paper Doll’s Oscar Dress. It’s Outfit 36 from Oscar De La Renta’s Pre-Fall 2014 collection. Here is another favorite from that collection. I admit the put this dress together in a rush. Somehow February has completely gotten away from me, so here’s no wig to go with today’s dress, but you an use one of the wigs from the paper doll’s page, I think in a pinch. And I am super pleased to announce the Miss Missy’s Paper Dolls has joined in the paper doll creation fun. So, here is her interpretation of the base doll. Pop over to Paper Doll School, Pop Culture and Paper Dolls, Paper Doll School and Miss Missy’s Paper Dolls to pick up their versions of today’s gown. They should all be posted in the next few days. Stay tuned for next month’s theme- Fashions from Space! So, what do you think of my choice of Oscar gown? Too much? Just enough? And, as always, if you love the blog, then think about donating to support it on Patreon. Really lovely. It’s like fabric origami. Love it! !